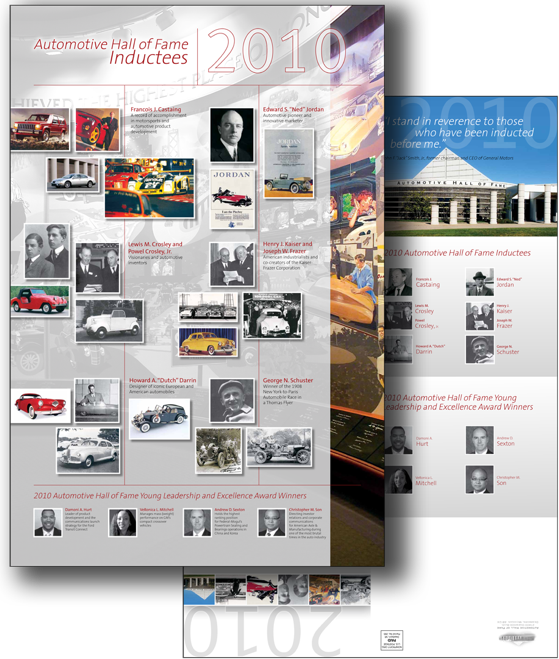 The Automotive Hall of Fame needed an invitation to their annual inductee ceremony. Instead of a traditional invitation, a poster was designed to highlight the new inductees. The poster was designed to highlight their accomplishments, and provide a graphic reference to the event. The front side of the poster carried the invitation to the event. The piece was folded and mailed. In addition, the poster on the back side was printed in extra quantities and sold in the lobby gift shop.